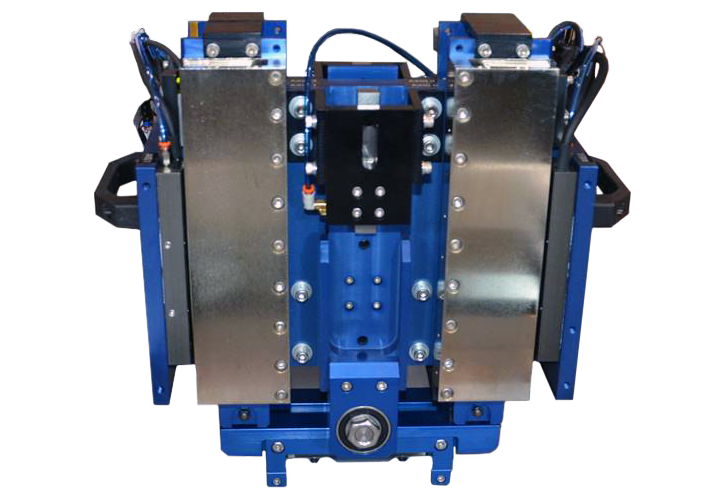 The SLP-II Print Head from HMI is a Self Leveling Programmable Print Head. The SLP-II head uses a series of motors and sensors to level itself parallel to the tooling surface. The head can use those same mechanical and electronic components to automatically set squeegee pressure, down-stop and lift points through the print cycle. Fully programmable servo pressure, flood height, downstop location, and squeegee leveling to the substrate. As a fully automated print head, the SLP-II can be completely integrated into the entire line of HMI automated printers. This allows the operator to create and store several complete printer setup recipes in the printer that can now include print head settings. Additionally, as the process environment changes the SLP-II head will compensate to maintain the preset performance criteria programmed from the recipe. The SLP-II Print Head has two squeegee holders, individually programmable. Depending on the setup, each squeegee can be setup as either a flood squeegee or a print squeegee. In an alternate print or SMT application, both squeegees can be setup as print squeegees. Each squeegee independently monitors its own performance and adjusts accordingly to maintain consistent print results. Controls and settings for the SLP-II head are made through the printer. They are user friendly including graphic representations to assist in the association of commands with the performance of the head. Various levels of security can be introduced to minimize variations from a printer setup or to centralize process control. The SLP-II Print Head is the last piece of the process automation puzzle. In combination with HMI automated features, the printer can now load, align, print and unload without operator interaction. The printer can be used to produce multiple products, requiring multiple setup adjusts, by simply recalling saved setup routines from the printer’s memory. Increased versatility, monitored performance and enhanced throughput on the print line through automation contributes to a higher return on investment.